For the past few months, Strongwell has worked with high school senior Walker Little to enrich his educational growth through his work-based educational internship. Little is currently a student at Virginia High School located in Bristol, Virginia. After a plant tour at Strongwell’s advanced manufacturing headquarters, Walker worked with Debbie Browning (Engineering/STEM Instructor and Work-Based Learning Coordinator – Virginia High School) to explore an educational partnership with Strongwell. Currently, Virginia High has a First Robotics Team (FTC team #7217) within the For Inspiration and Recognition of Science and Technology (FIRST) Chesapeake district. To showcase regional advancement within the National Math Festival in Washington D.C., the organization submitted a regional casting call for groups which utilized an intensive amount of mathematics within their robotic design. 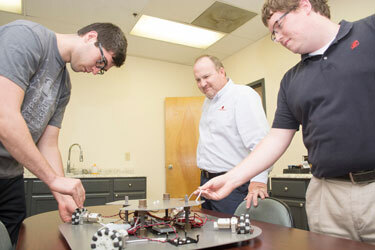 Walker and his team were chosen due to his robot incorporating a holonomic drive system. The design and function of the robot favored limited start-up acceleration. When a robot gains advanced acceleration, its internal gear movements are worn prematurely due to excessive drag. With a holonomic drive system, the robot prevents loss of momentum through the use of a gyroscope, translating into an ability to constantly change its orientation without changing the direction of its wheels. 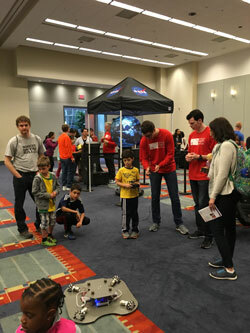 Walker Little and William Barrett were invited to the National Math Festival in Washington D.C. to showcase the holonomic drive robot as an exhibit for 8 hours while explaining and demonstrating its capabilities to hundreds of attendees at the event. Both individuals shared the struggles of programming, design and math for this particular project. Prior to placement at his work-based internship with Virginia High, Walker and his team outfitted the custom holonomic drive with an aluminum stock base. Upon arrival at Strongwell, he gained a better understanding of benefits of composites versus aluminum in light weighting designs while providing more strength for his robot application. The aluminum stock base was replaced with an EXTREN® plate and FIBREBOLT® stud and nut system. During his experience here, Walker was able to collaborate alongside one of Strongwell’s Structural Engineer, Stephen Browning, P.E., as well as the fabrication department and R&D lab to better understand the pultrusion process, design and fabrication of composite materials.